About the only place this rhum falls down is that for all the information we have on it, it leaves us begging for more. It is a heritage (or “halo”) edition rhum, a bland of six millésimes, those years considered to be of exceptional quality – the legendary 1885 (R-010, remember that? ), 1934, 1952, 1976, 1998 and 2000, and yeah, what else could we possibly want? Well, how much of each was in the blend, for one, and how old each of those components was, and further, how much (if at all) the final blend was itself aged. But I’m not whinging too loudly. This is an impressive dram, and only 800 bottles were issued for the 250th anniversary of the plantation (I think this was 2015). One wonders if it was a coincidence that each bottle supposedly retails for €800, and yes, it’s still available, the secondary market has thankfully not gotten into the action here as yet. Nose – Luscious, voluptuous. Caramel and dark fruits, hinting at (get this) a column still Demerara, except that it’s much lighter. Florals and sweet ripe fruit are exhaled with joyous abandon – marula fruit, cashews, light pineapple, and the sweet and over-ripe scent of mangoes that fall under gargantuan tropical trees in such profusion they rot right there on the ground. Also oaky, somewhat sharp, some freshly sawn lumber, pineapple, tobacco and grated ginger. Whew…quite a smorgasbord, and well assembled, I assure you. Palate – After the stronger Neissons, this seems almost tame. Much of the nose has been retained – ripe fruits, cherries, the crispness of gooseberries, herbs and grass and cream (“krauterquark” as the Germans would say). Much of the heavier components of the blend lose some definition here, the younger ones take over and contribute a light, frisky, sparkling profile. Pleasant, just not earth shaking. Light strawberries, vanilla, oak (perhaps a bit much), breakfast spices, cumin, and a vein of citrus and salt caramel through the whole thing. Finish – A shade brief, with the aforementioned fruit, cumin, citrus, salt caramel and raisins, lots of raisins. Thoughts – I’d hazard a guess that the more recent vintages, say from 1976 on, contribute some sprightliness and vigour, some of that sharpness and tart fruitiness to the blend, while the older ones give depth and solidity upon which these rest. For my money I’d prefer somewhat less of the former, more of the latter, or some better balance between the two, and perhaps a greater strength – all the elements of a great rum are in evidence, but it’s too light. That’s not to say it’s bad – not at all! – but it does make for ease and comfort; I’d personally prefer something more aggressive and complex which would elevate such a great collection of vintages a few points more. 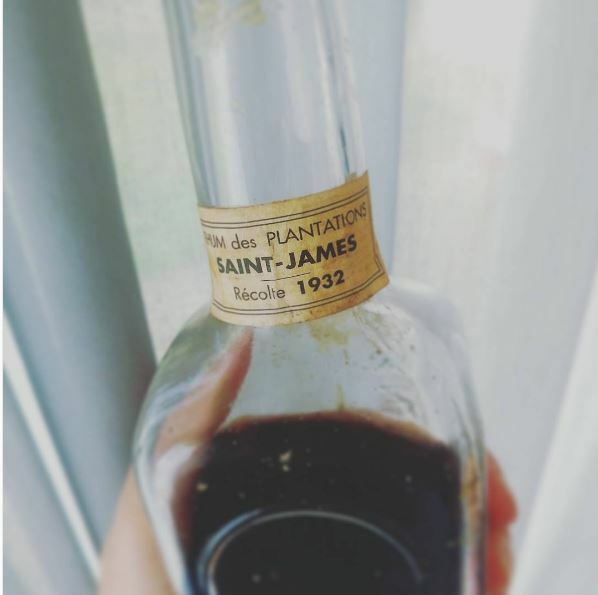 St. James has taken its place as the source of the most ancient rhum I’ve tried in my life (the 1885), and to this day they continue to make some very good agricoles. But you’ll forgive me for yearning for their old, out-of-production rhums, made in times that predate my own grandfather; and I like trying them not just because they’re so old and so appeal to the collector in me, but because I find it fascinating how different they are to what’s made nowadays with the appurtenances of modern technology and skill. Such dinosaurs don’t always appeal to the modern palate, true, yet they remain intriguing and beguiling signposts on the road that describes how we got to be where we are now. Nose – Wow – talk about a rum going off at right angles to expectations. Starts off with old, damp, musty cellars and rotting newspapers paper granny stored there with her preserves; bananas and light oranges, plus the vegetal saltiness of a bouillon into which she dumped one too many maggi cubes. Also pickled gherkins in vinegar, molasses and peaches in syrup straight from the can. Palate – Smooth and easy, quite warm. Opens with a vein of thin honey, to which additional flavours of caramel and bonbons are added; leaving it to open up then provides anise, prunes, more molasses and peachess (less syrup this time), and burnt sugar. Finish – Short and warm, very pleasant, mostly cocoa, raisins, nuts and again that thin vein of honey. Thoughts – Well, this is quite some rhum. Though I like it, I’m also not too sure what to make of it – surely this is not a contemporary agricole, let alone a standard, present-day St. James. Lekker, one might say…yet much of what conforms to modern sensibilities and ideas of what an agricole is (the grassy, clean profile) is missing. It’s also rather thick – fortunately without being cloying – and that makes one wonder whether it was doctored, messed with or dosed (it’s likely because they boiled the cane juice in the old way as a sort of quasi-pasteurization process). In any event, when anyone tries a rum made this long ago, it’s a window into a different time and a different rum-making mentality. It might be worth sampling for that reason alone. Like with many old rhums one is sent or which one finds in shadowed corners of sleepy back-alley shops, it’s almost impossible to track down the provenance of rhums like this one. I mean, do a search on “Rhum St James 47%” and see how far that gets you. As far I know this is not a millesime (it’s not the superb 1979, or the 1976 for example), not a massively aged old rhum (in fact, its profile suggests the opposite), and was noted simply as being from the 1970s or 1980s. Not much to be going on, I’m afraid. And yet, and yet…it’s such a lovely product. Let’s just sadly pass its unknown pedigree by, and appreciate it for what it is. Nose – Sweet, delicate, crisp nose, that deepens as the minutes tick along – by the time you’re ready to taste it’s almost a different rum than the one you start out with. Faint brine and dusty hay, bags and bags of a lawnmower’s fresh grass collection. And it just keeps coming, with peaches, apple juice, and the musty tones of damp black earth and rain striking hot red bricks. Palate – All that musky depth seems to vanish in an instant on the sip. Amazingly, the delicacy returns, and the 47% hardly burns or scratches at all, so well controlled is it. It marries the subtlety of ripe cherries, honey, potpourri and a little mustiness. There’s even some soap and air freshener in here somewhere (in a good way). Smooth and elegant, with some of the sprightliness of not-too-aged youth. Whatever oak there is in this thing, it’s held at bay very nicely. It’s cheerful rumlet that just wants to play and mix it up with the boys. Finish – Medium length, no surprise. Closing aromas of citrus, light honey, grass, fanta and light florals, all in a very well handled amalgam (where did the rain and black earth go?). But never mind, still a lovely fade. Thoughts – A little ageing, a little more beef, and this rhum would have been superb. As it is, it is merely very good, and I wish there was a bottle, not a mere sample in my collection. It may be young, but it’s good young, know what I mean? Supposedly the 1970s and 1980s are the rarest vintages of many Martinique rhums – nearly thirty years later, that’s as little as makes no difference, since any and all rhums from that era are now collector’s items, irrespective of the country. Many have been lost forever and aren’t even remembered. This one from 1986 deserves to be rescued from the pit, however, because it’s pretty good. Saint James on the north east coast of Martinique has been around since 1765 when Father LeFebure of the Brothers of Charity first devised a cane spirit, which he began shipping to the British colonies up north. 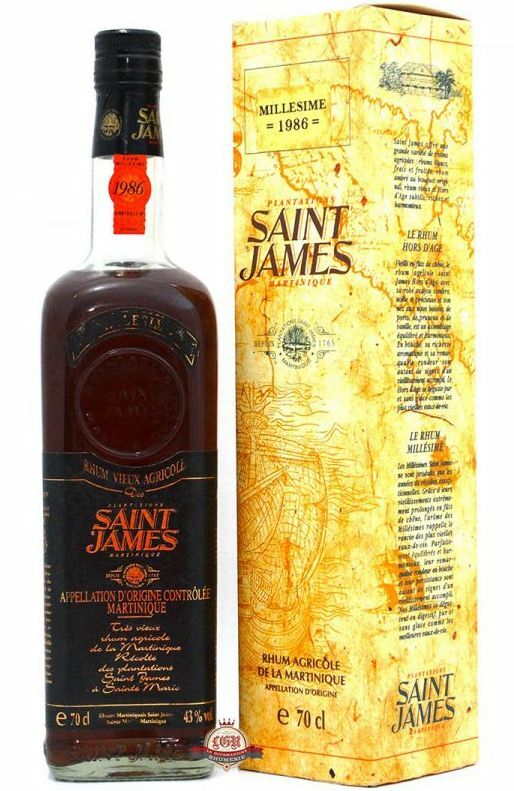 Initially he named the rhum Saint Jacques after a gent who actually bought the island in the 1630s (from the Compagnie des Îles d’Amérique) and developed it into a successful French colony – but not one to let sentiment (or his faith, apparently) get in the way of sound commercial bastardization, he renamed it Saint James to sound more english and thereby increase sales. Nose – Wow! What a lovely, deep, fruity nose. Is this an AOC agricole? Nope, the island adopted it only in late 1996, so all kinds of weird stuff was going on before then…and thank heavens for that. This nose is lovely – vanillas and oaken tannins, white flowers, sweet peaches in syrup, but held at bay by a crisp driness almost like a Riseling, and ending up with (get this) fanta soda pop and bubble gum. Don’t ask me how, I just smell this thing and call it as I see it – but it’s great. Palate – On a medium-to-light bodied, deliciously warm mouthfeel, the Fruit Express continues to romp: dark red cherries, apricots, wound about with light and chirpy citrus peel; dates and raisins, lime juice soaked brown sugar…yet somehow the rhum remains light and sprightly, not heavy at all and without any kind of overbearing sweetness. Last tastes with water add white chocolate, some weak coffee grounds and grasses wet in the rain, all very very nice. Finish – more a summing up of the preceding than anything new, and quite short, perhaps to be expected from 43%. Warm, a little bite, clean and very clear, with more leather and oak, some citrus (a little), and fruits. Only complaint is I wish it was longer. Thoughts – The AOC is something of a double edged sword to rummies – drinkers and makers both. Many appreciate the standards, others chafe under the restrictions. 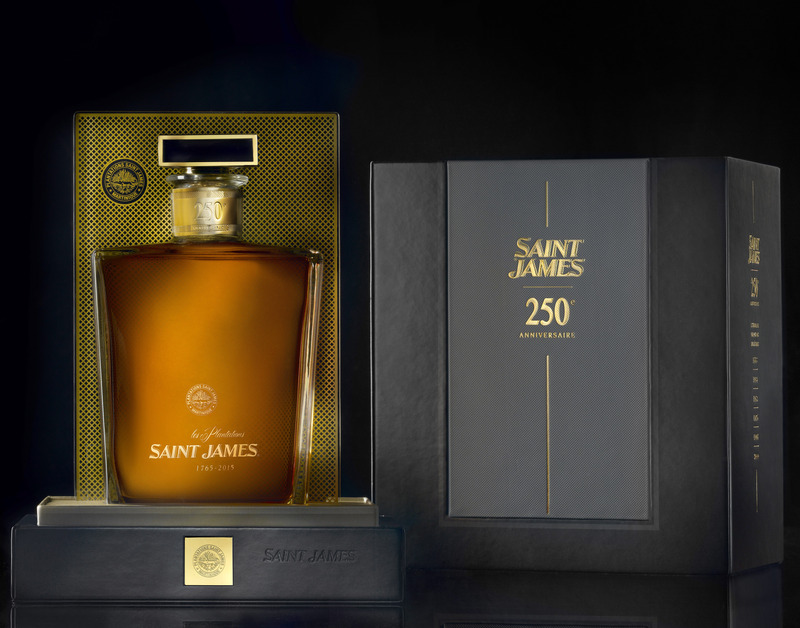 It’s always interesting to see how different the old ways are from the new, just by comparing any modern aged Saint James with this one rhum from a generation ago. The 1986 may be long out of production, costs upwards of €500 and rare as a negative Velier review, but that doesn’t mean the ways of the old masters were in any way bad ones. Yes, you read that right. 1885. Holy molasses this thing is old. How can anyone even begin to assess a spirit that was made so incredibly long ago? I’m literally in awe. What was going on back then anyway? Sino French war in Vietnam; the Mahdist army overran Khartoum and killed General Gordon; AT&T was incorporated in New York; Gottlieb Daimler patented his engine; the North West rebellion in Canada; the Statue of Liberty arrived in New York harbour; the Third Anglo-Burmese war…and St. James began bottling its vintages that year, same year as they introduced the square bottle. It may be the very first ever made, anywhere. At around £6000 per bottle, all one can say is “ouch,” be grateful for the sample, and dive in on bended knee with head reverently bowed. Nose – Dark dark dark and so very plush. Made me feel I was sinking into an old Chesterfield. Plums, dark grapes, figs and black olives without the salt. Some vegetal in the background (really far in the bushes). Deep and thick, smoky, dusty. Not very sugary at all, and had some essence of tart and juicy overripe pears. Then soy sauce and teriyaki, mixed with dark molasses soaked brown sugar. Fresh and heavy, both at the same time. Palate – Warm, full-bodied, thick and heavy. Must have been made before the French islands moved full time to cane juice. Dark prunes and cherries in syrup…and yet, and yet…where’s the sugar? Treacle, bitter chocolate, pancakes and maple syrup, a cereal note in there somewhere, maybe rye bread. Molasses, plums and pomegranates, a flirt of anise, some oakiness but nothing excessive. Incredibly deep and tasty, amazingly well balanced. Finish – Short and warm. Some last notes of licorice, molasses and raisins, and some dry earthy mustiness to wrap it all up. Thoughts – It was a fantastic rhum (rum?). Can’t imagine what a more leisurely tasting spanning many days would be like. The depth of the thing is amazing, and I felt it worked well even for a more modern palate: it was quite a remarkably rich and complex beast, and it felt almost sacrilegious to drink it at all. Other – No idea how long it was aged prior to bottling. According to Antique wines & Spirits, it was bottled in 1952. Can it truly be 67 years old? No, not really. 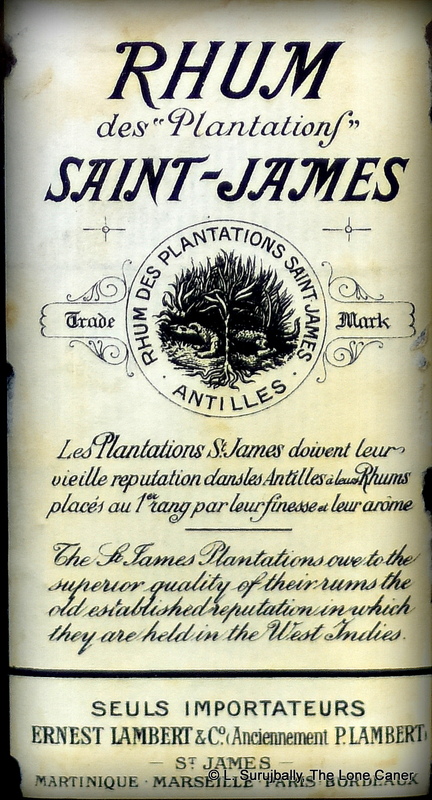 According to Benoît Bail who spoke to the master blender at St. James, all the 1885 stocks were in fact destroyed in the eruption of Pelee in 1902. Some bottles of the 1885 were over in Europe and Cointreau (when they took over the distillery), was able to locate many of them in Amsterdam, Paris and London, and sent them back to Martinique, where there were still on sale at St. James into the 1990s. 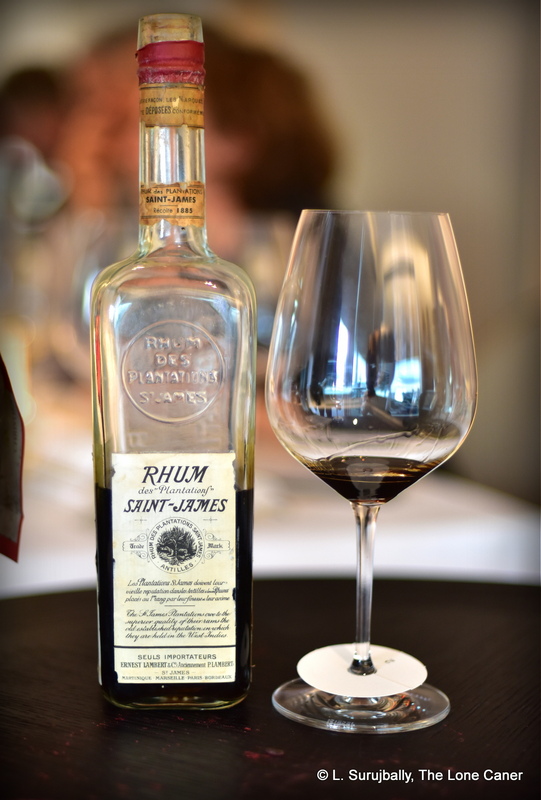 The master blender was of the opinion that the rhum itself was/is 8-10 years old, not more. Also, the different taste of the rums from that time (until the 1930s) arises because the cane juice was heated (not boiled) at around 40°C before fermenting it. Pasteurization, you see, had not yet made a big splash and large steel tanks were not common. I heard that Luca Gargano of Velier bought 300 bottles of this as an investment kin the 1980s. I can just marvel at the perspicacity and far-sightedness of the man. See also: Cecil’s (French) review on DuRhum is also pretty good.